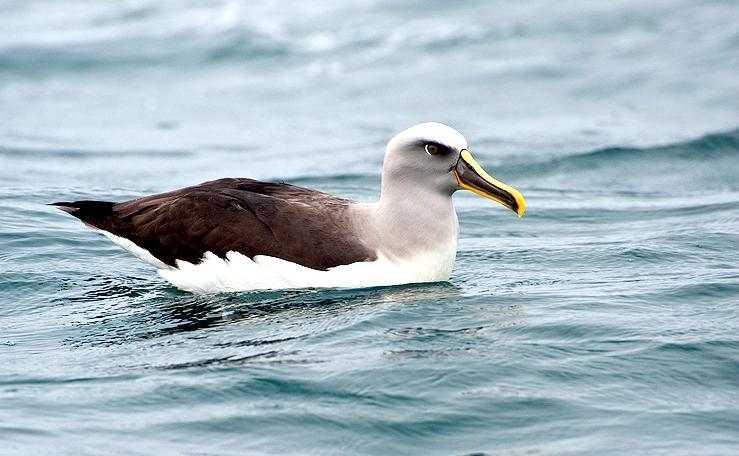 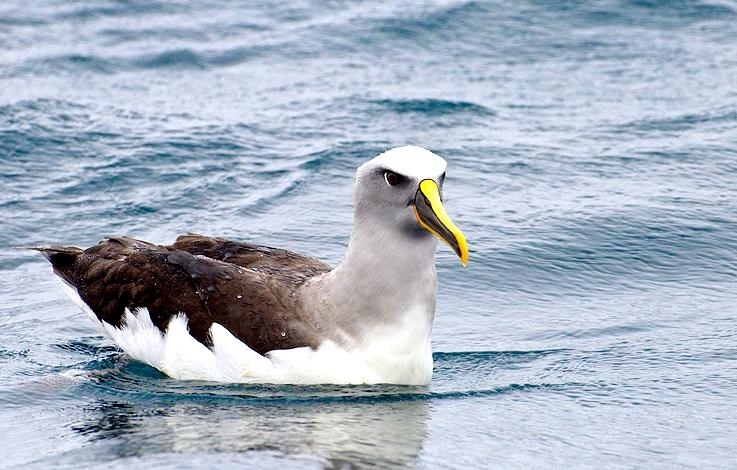 The Buller’s Albatross are one of the more abundant small albatrosses occurring around coastal areas of New Zealand, particularly from Cook Strait south. 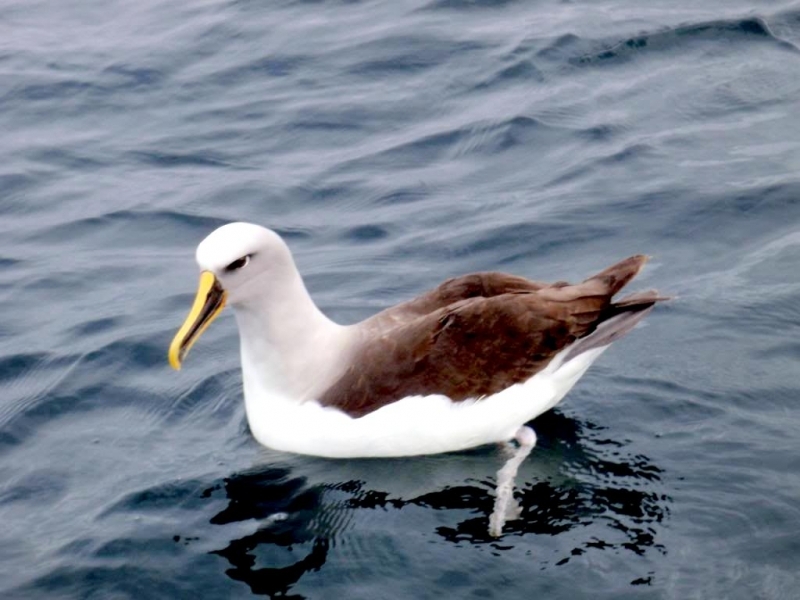 Their striking black-and-golden-yellow bill and smart black-and-white plumage make them readily identifiable as they scavenges close to fishing vessels. 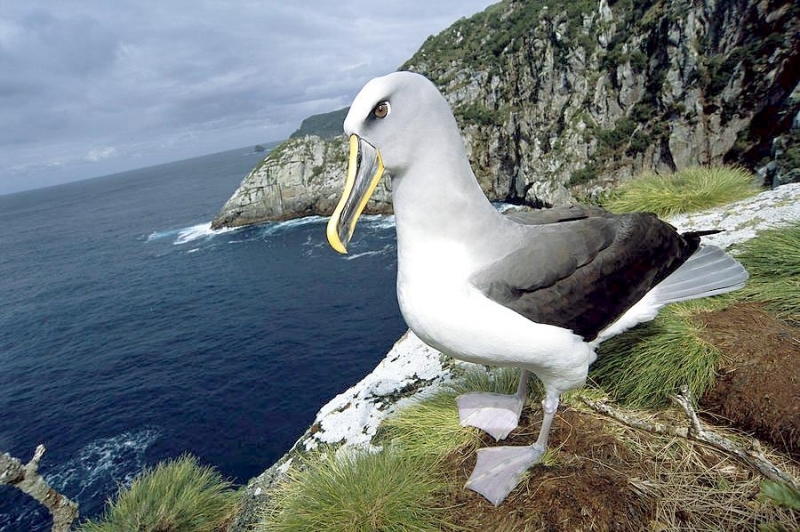 The bird was named for the New Zealand ornithologist Walter Buller. 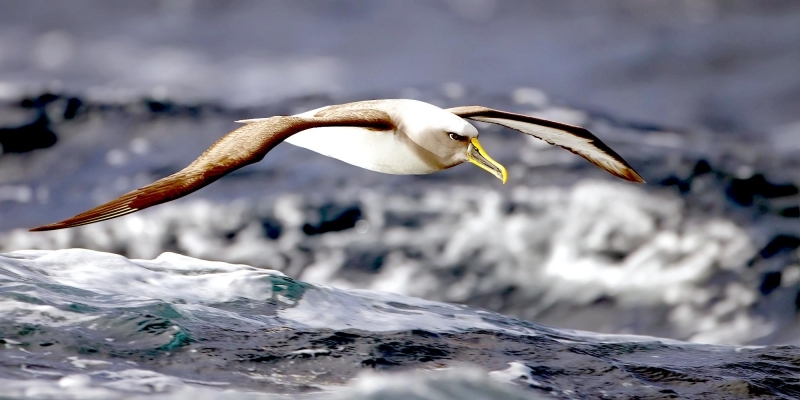 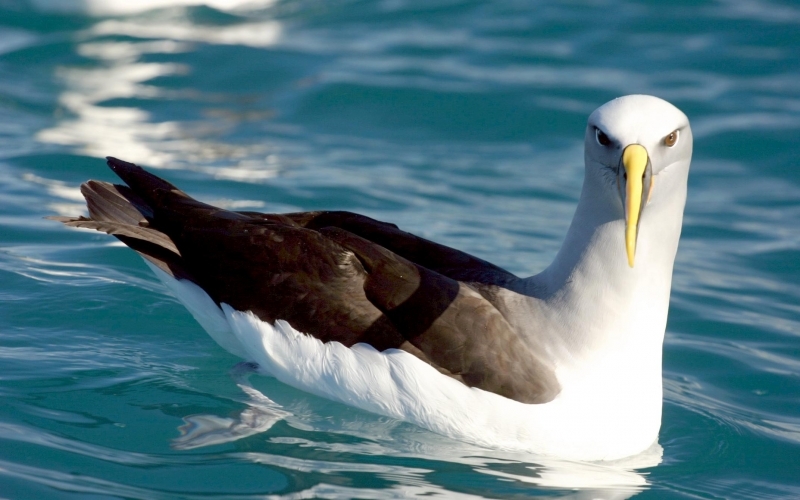 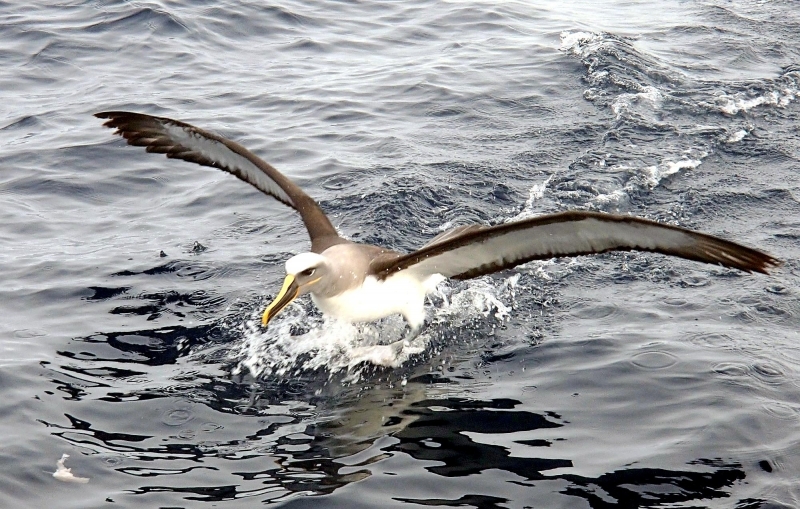 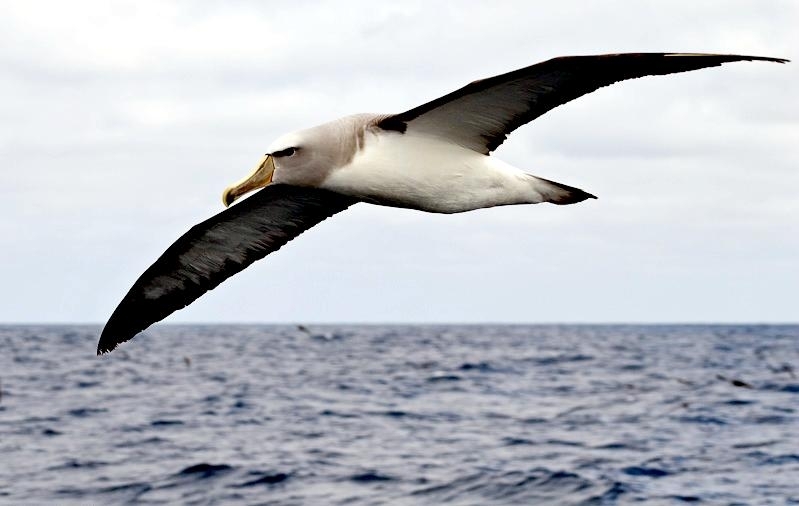 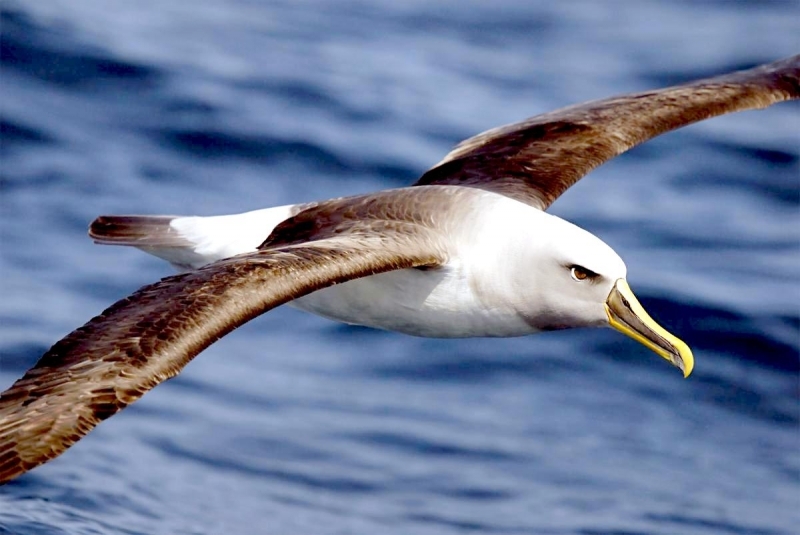 The name albatross came from the Arabic word al-câdous or al-ġaţţās. 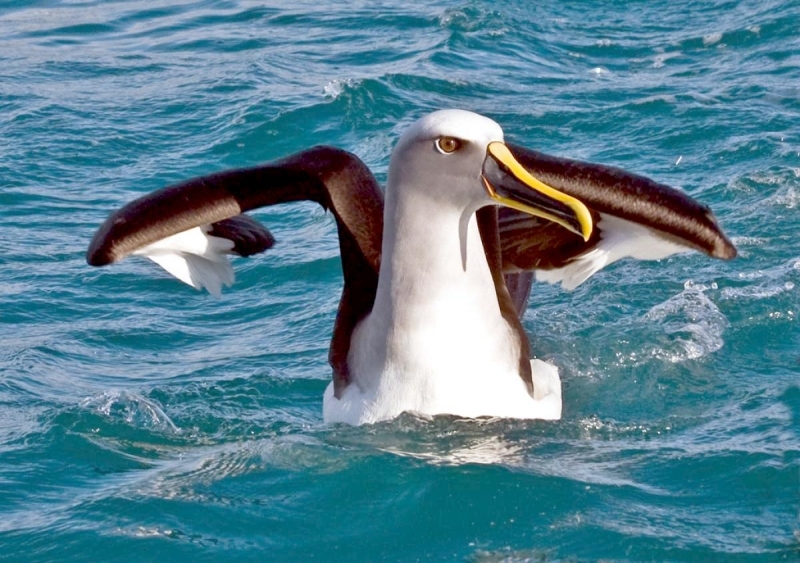 This means “the diver” and later became English, also mixed with the Portuguese word alcatraz. 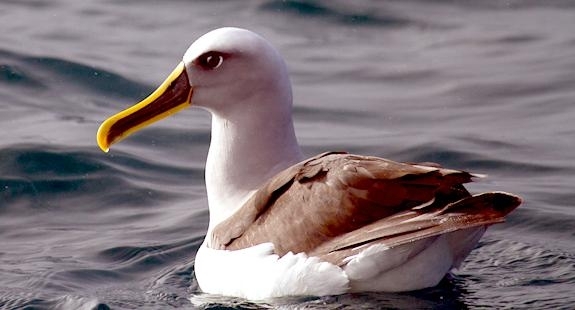 This is also where the name of the prison Alcatraz comes from. 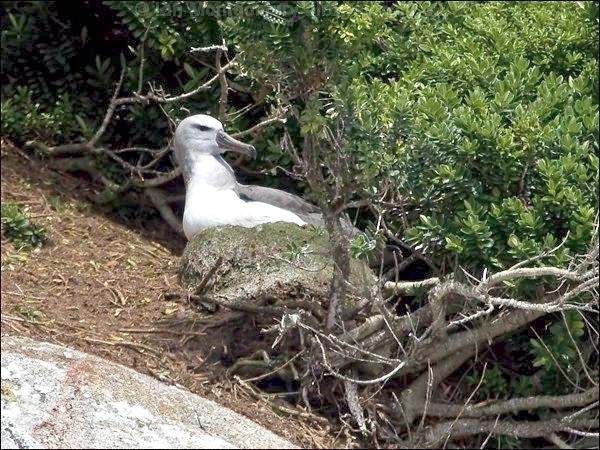 The Buller’s Albatross is unusual among albatrosses by breeding under tall, dense woody vegetation which sometimes requires it to walk up to 100 meters inland to reach its nest after landing in open tussock at the forest edge. 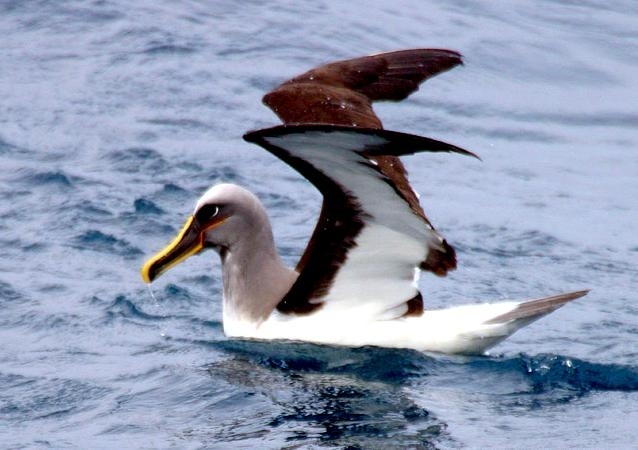 The Buller’s Albatross is one of the smallest of the albatrosses. 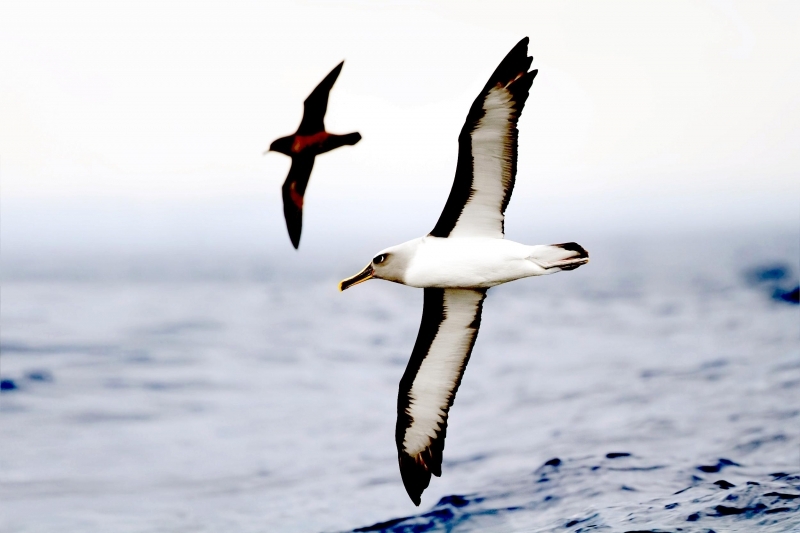 It is black across the upper-wings, with a white lower back & rump and black tip to the tail. 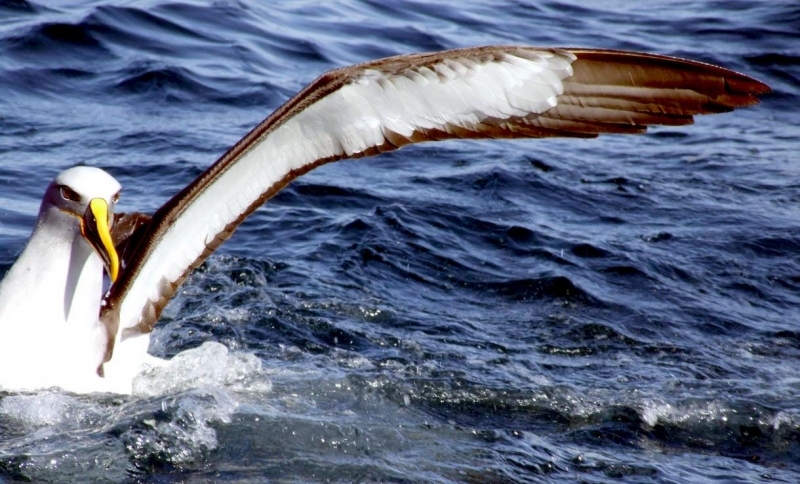 The underparts are white with a clear-cut broad black leading edge and narrow black trailing edge under the wing. 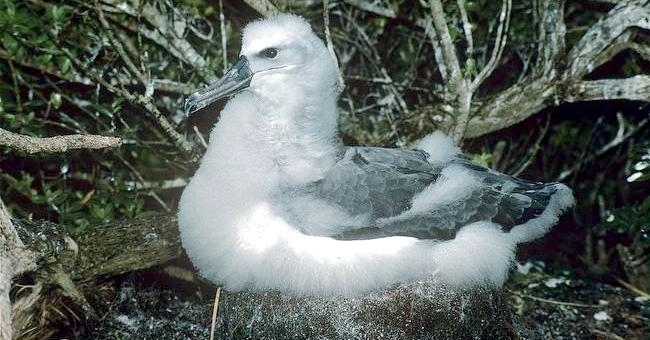 The light-gray neck and throat contrast with the silvery-gray crown. 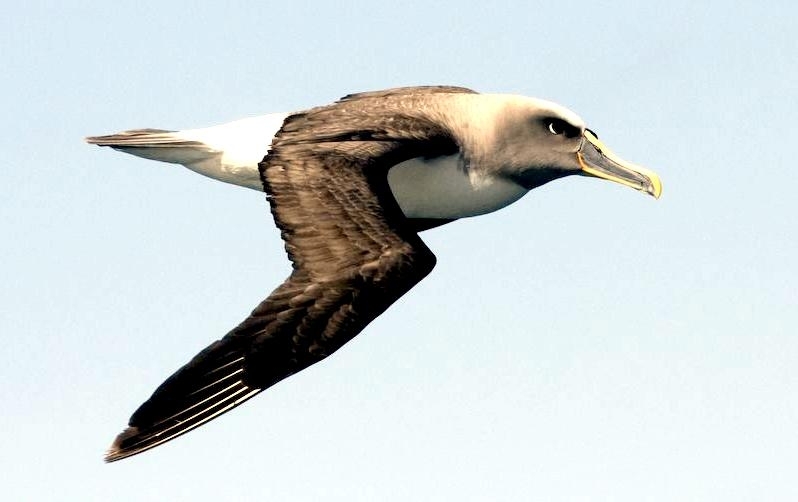 The bill is black with golden-yellow top and bottom plates. 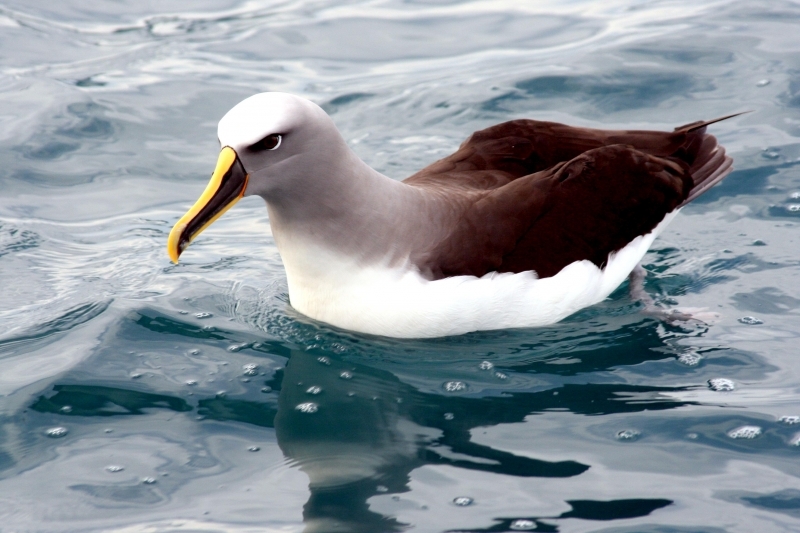 The Buller’s Albatross is usually silent at sea, though may give harsh croaking when squabbling for food. 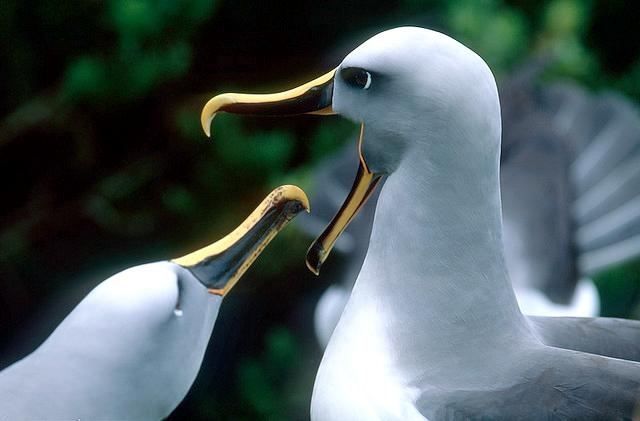 They utter a variety of brays, croaks and wails during courtship. 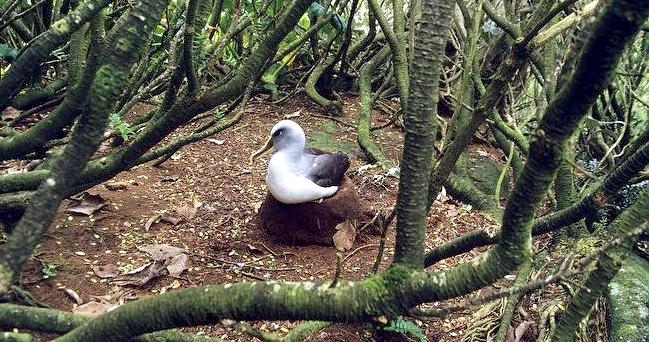 The Buller’s Albatross breeds on the Snares Islands and the Solander Islands with many of the nests under dense woody vegetation. 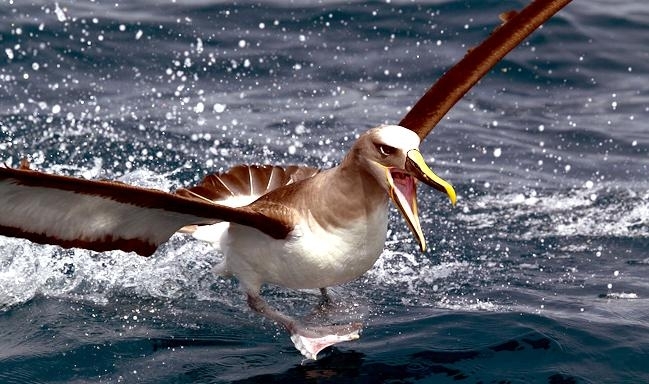 During the breeding season, it is commonly found in seas off the South Island and off south-eastern Australia, less often as far south as Macquarie Island and as far north as the Kermadec Islands. 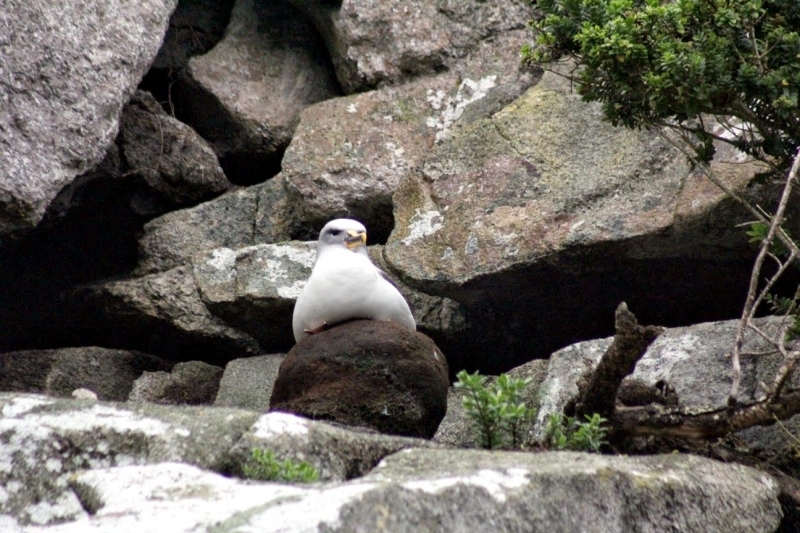 One was found ashore at Middle Sister Island, Chatham Islands. 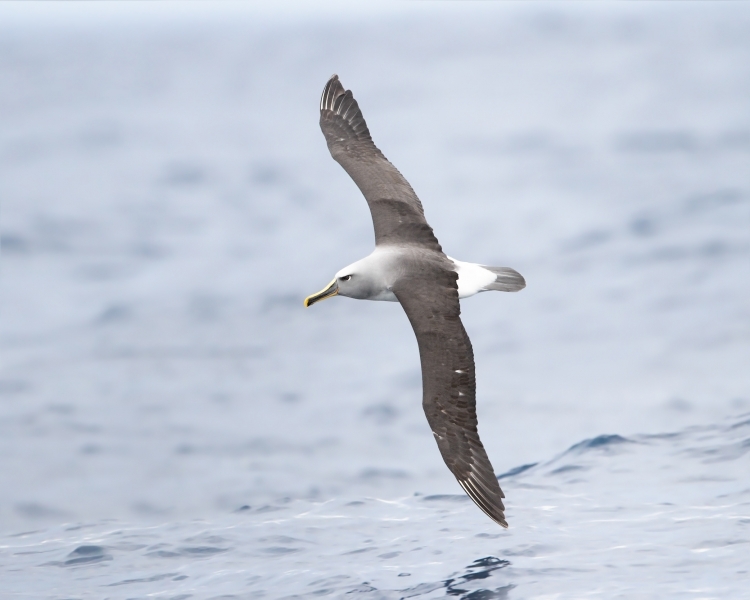 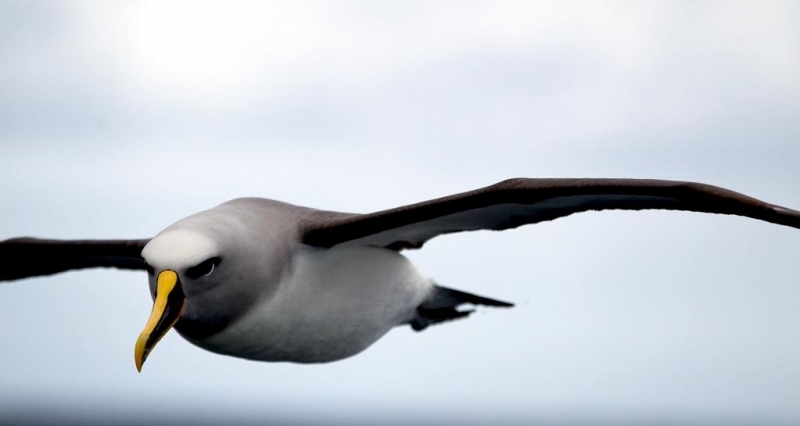 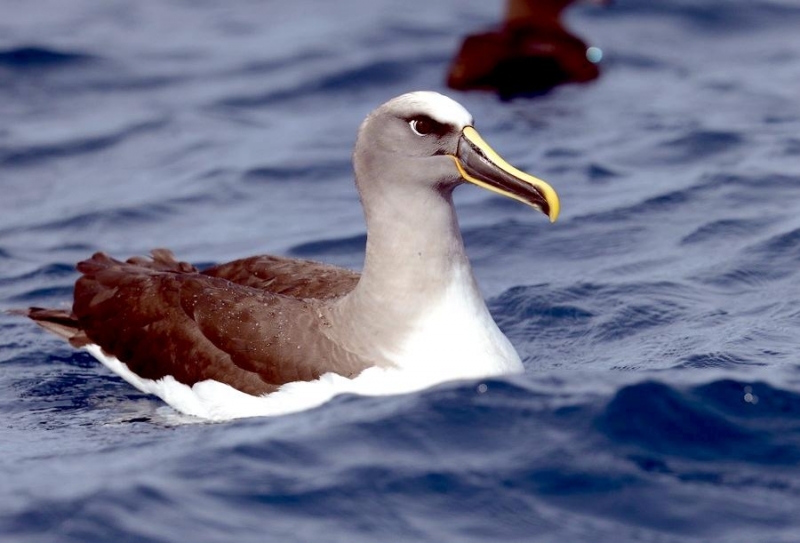 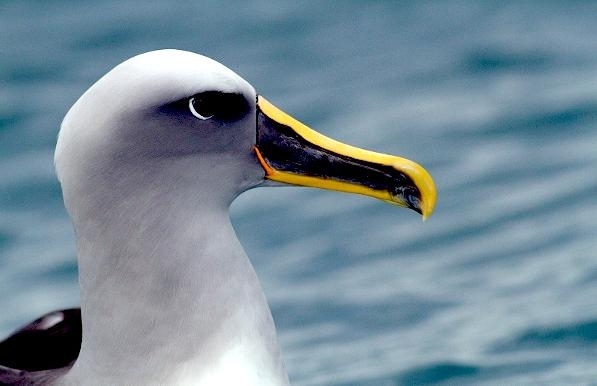 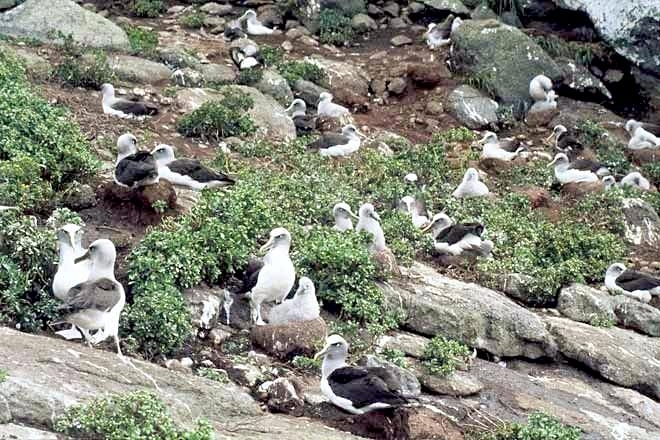 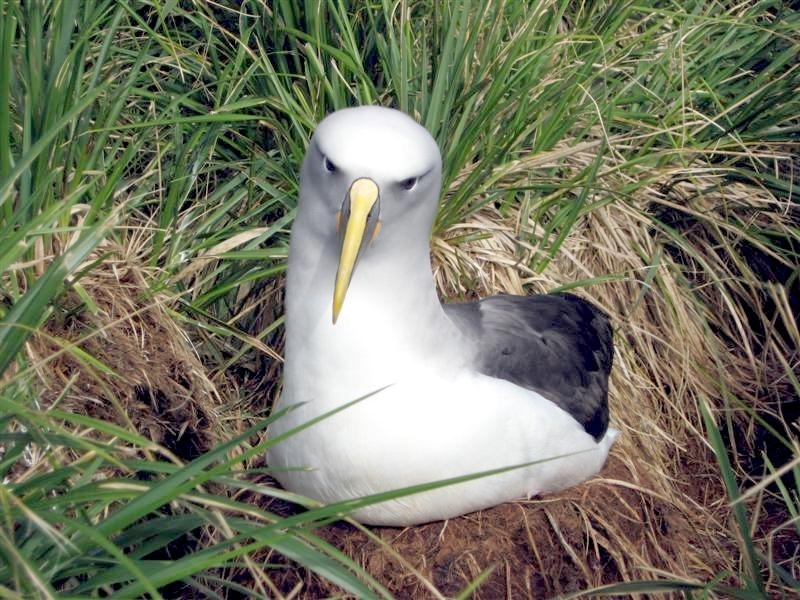 The Buller’s Albatross also breeds mainly in open areas on the Sisters and Forty-Fours, Chatham Islands, with a small population on Rosemary Rock, Three Kings Islands. 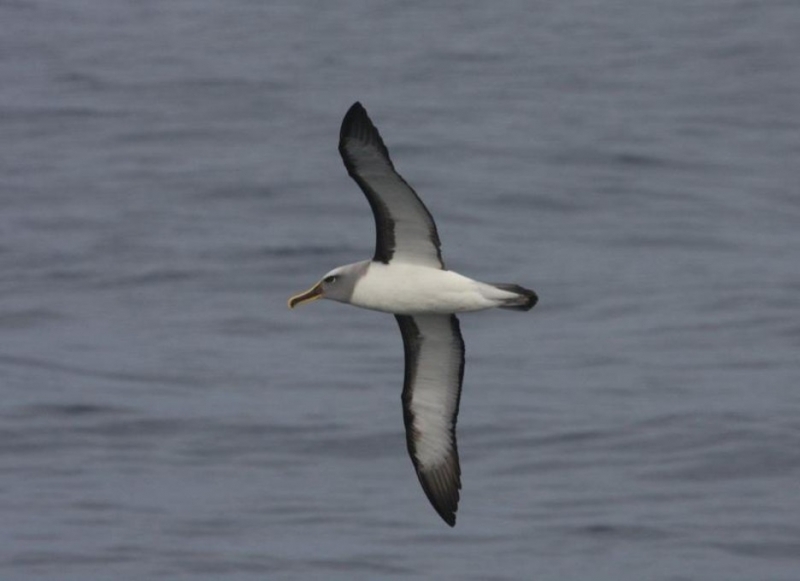 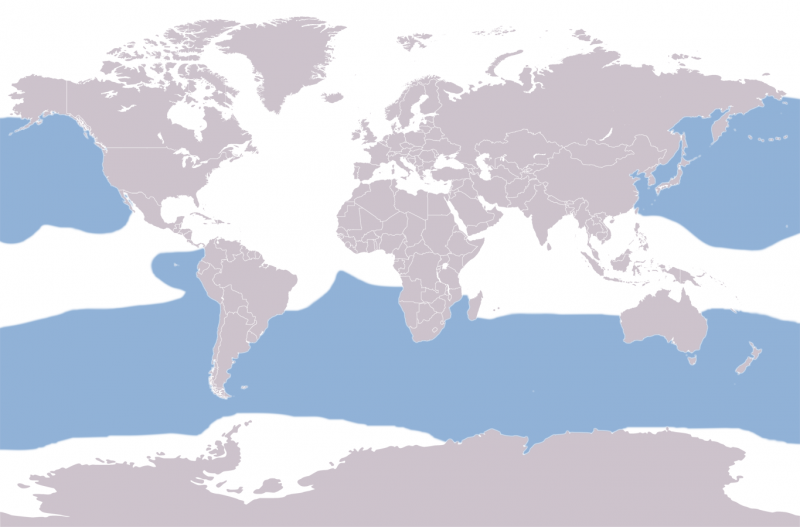 It ranges mainly off the Chatham Islands and eastern North Island, but has been recorded in sub-antarctic seas. 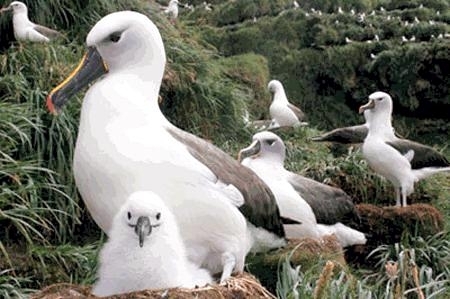 Total population is estimated to be about 32,000 breeding pairs. 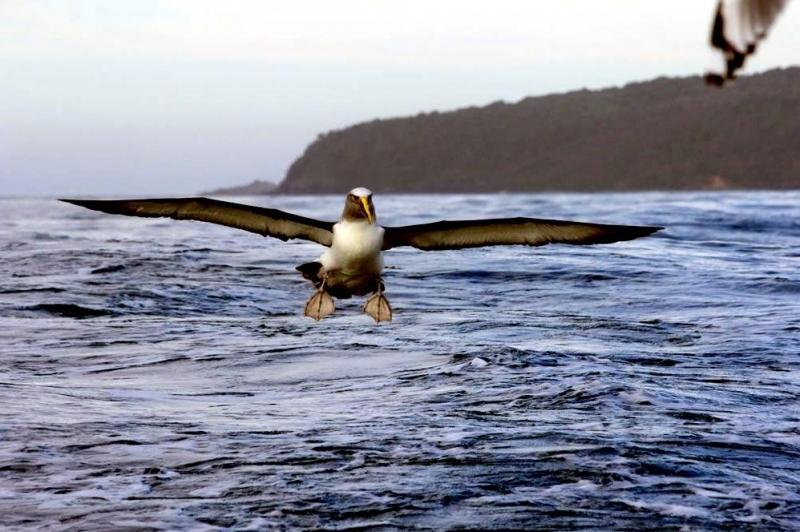 All breeding sites are free from mammalian predators, although an expanding New Zealand Fur Seal population at the Solander Islands may be affecting breeding success of those birds breeding on the lower slopes. 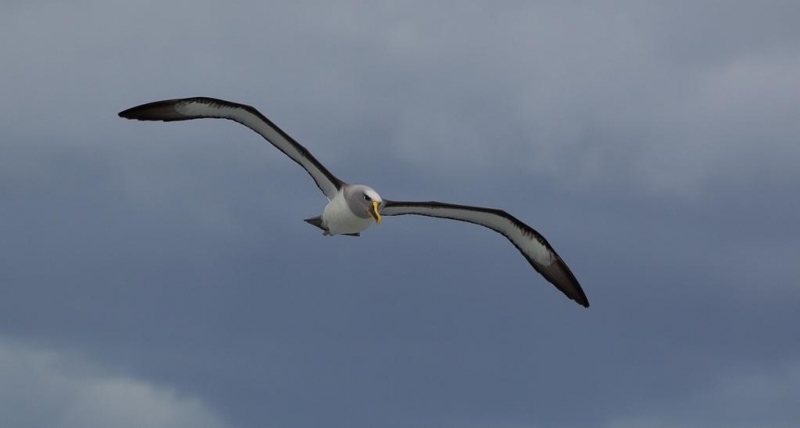 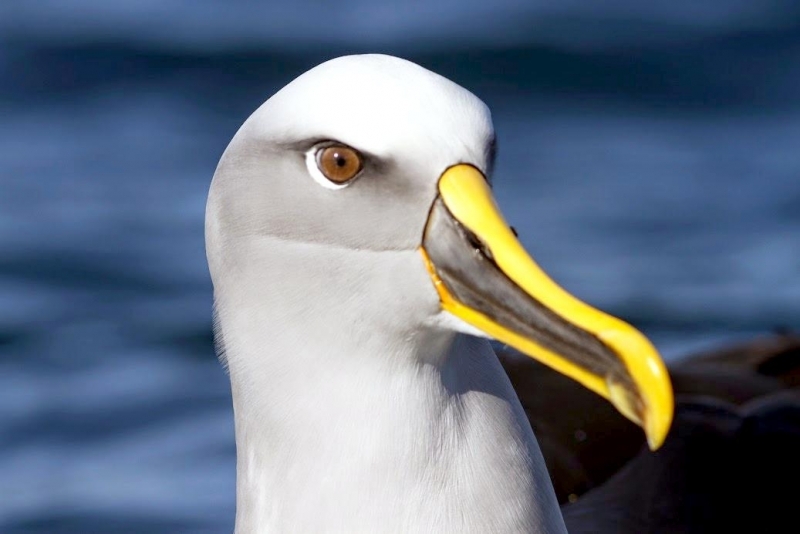 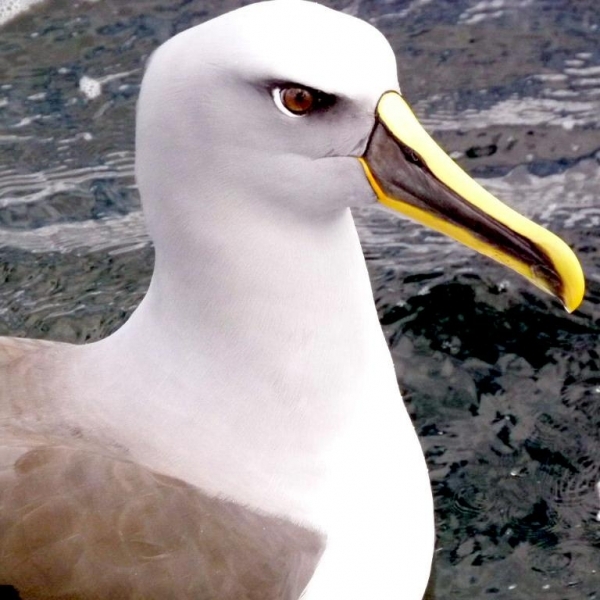 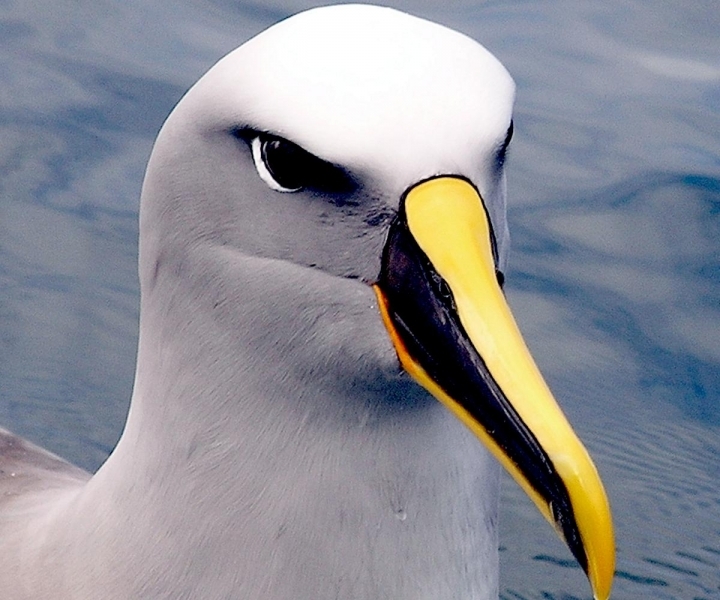 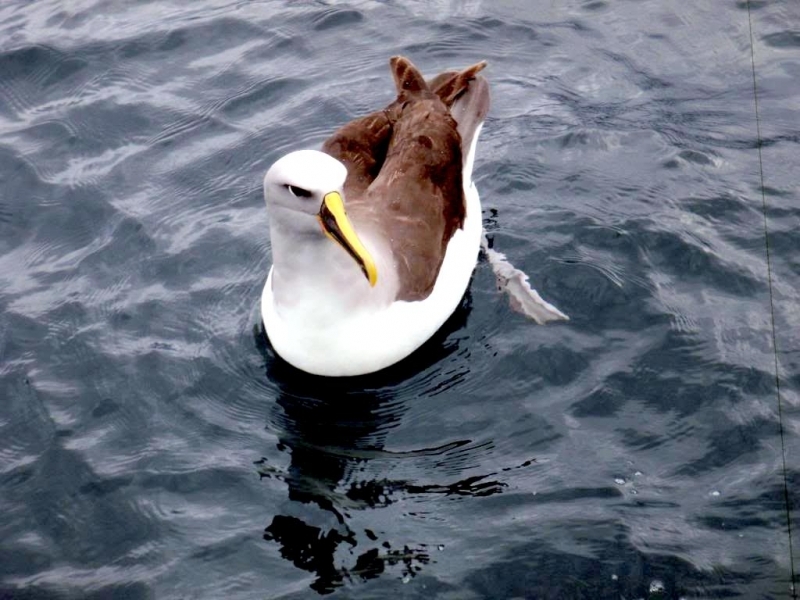 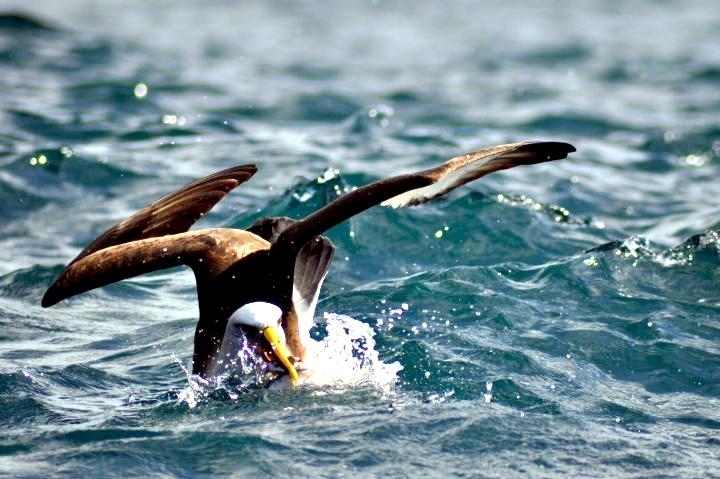 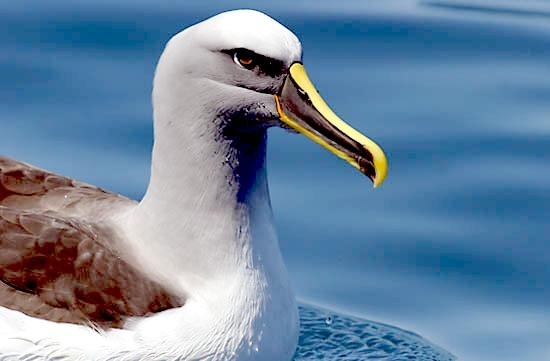 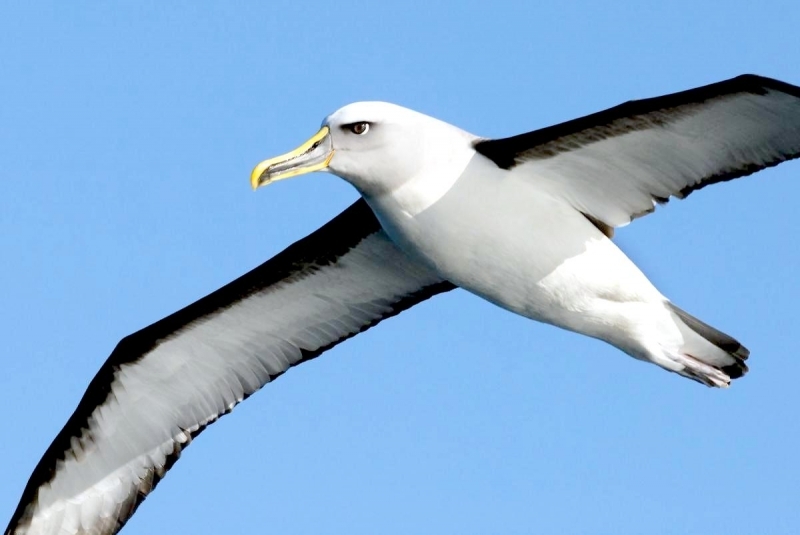 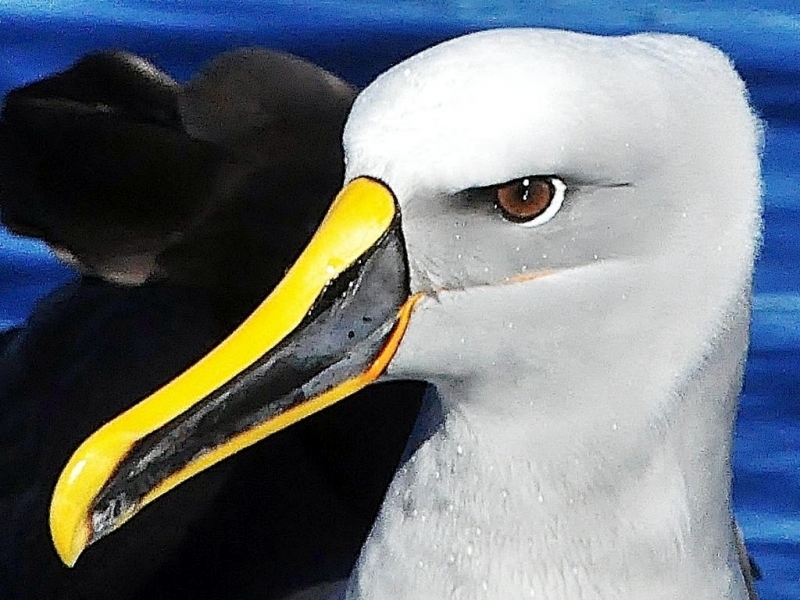 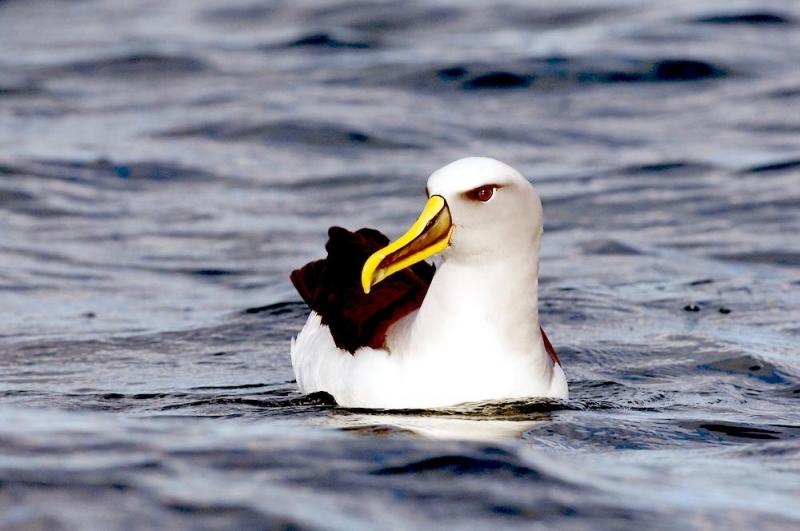 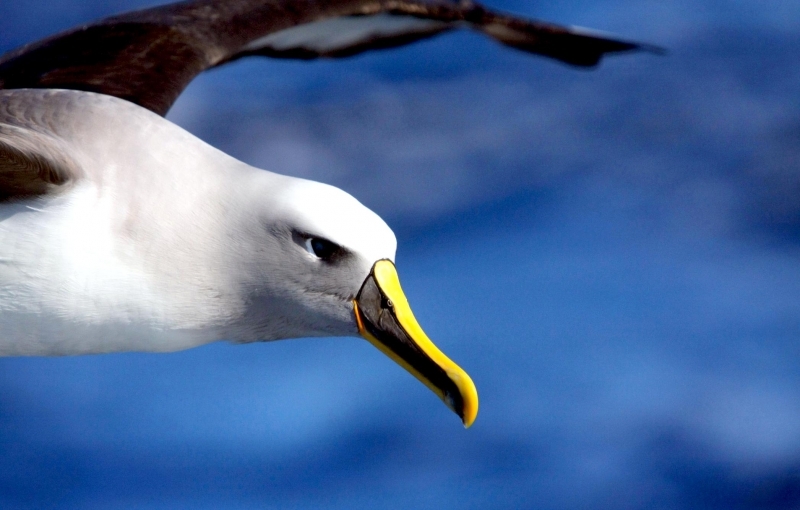 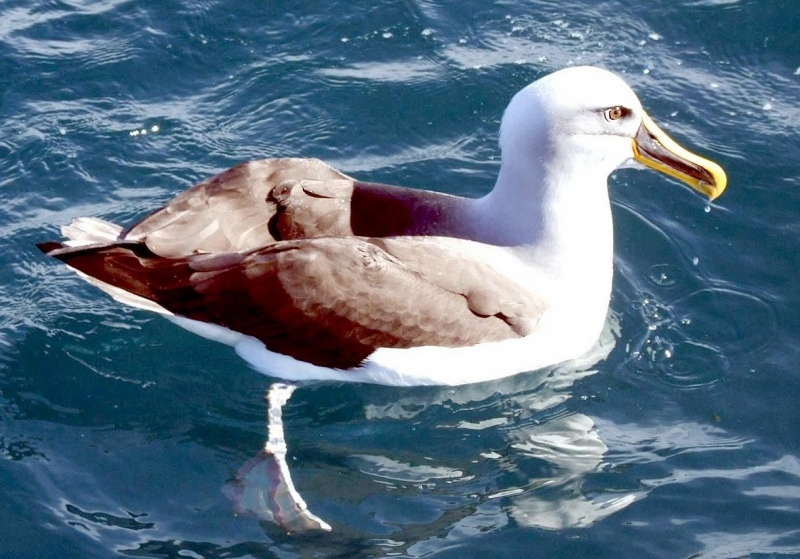 Buller’s Albatross is a common albatross species observed killed in the New Zealand fisheries, with demersal long-liners & trawling operations responsible for the majority of moralities. 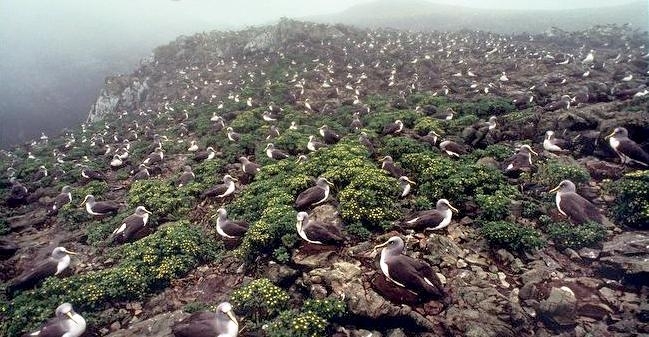 Colonies can be densely packed or loose. 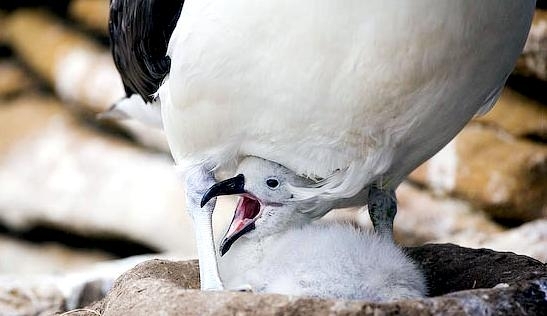 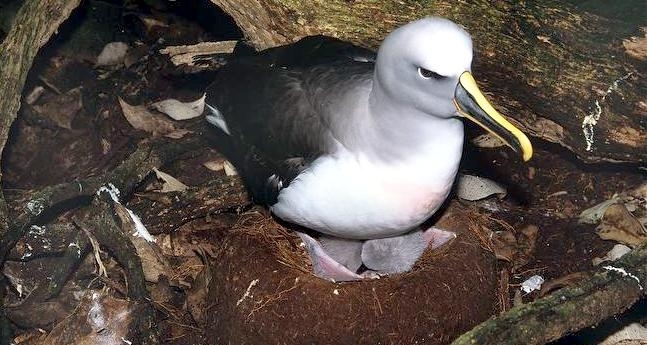 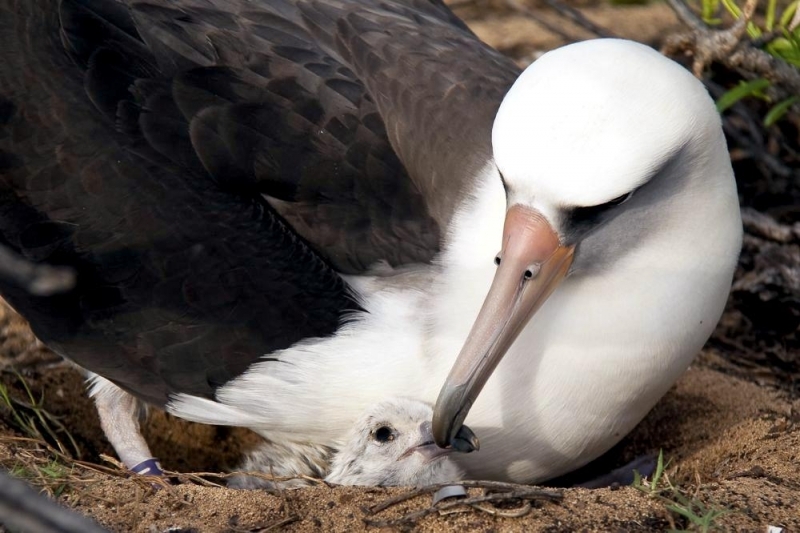 Buller’s Albatross are monogamous with shared incubation and chick care. 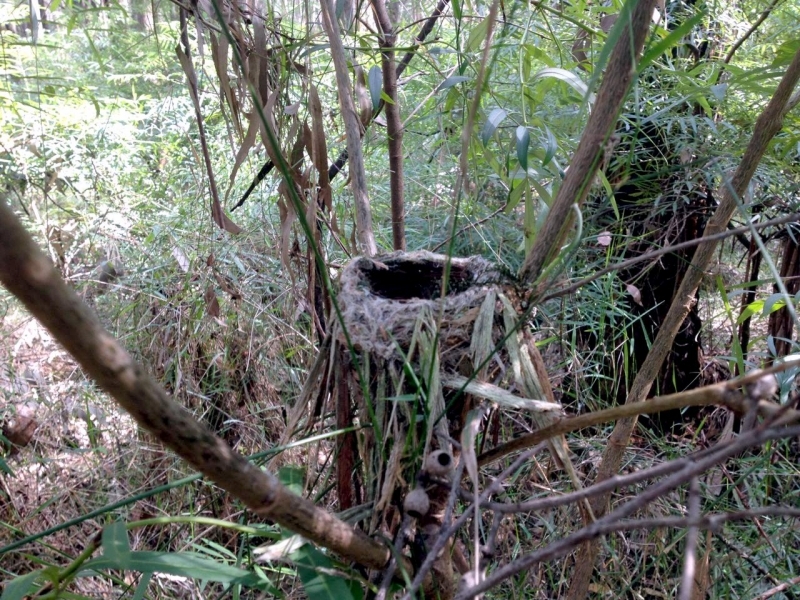 The nest is a pedestal of mud, guano & vegetation accumulated from the immediate vicinity and is used and added to year after year. 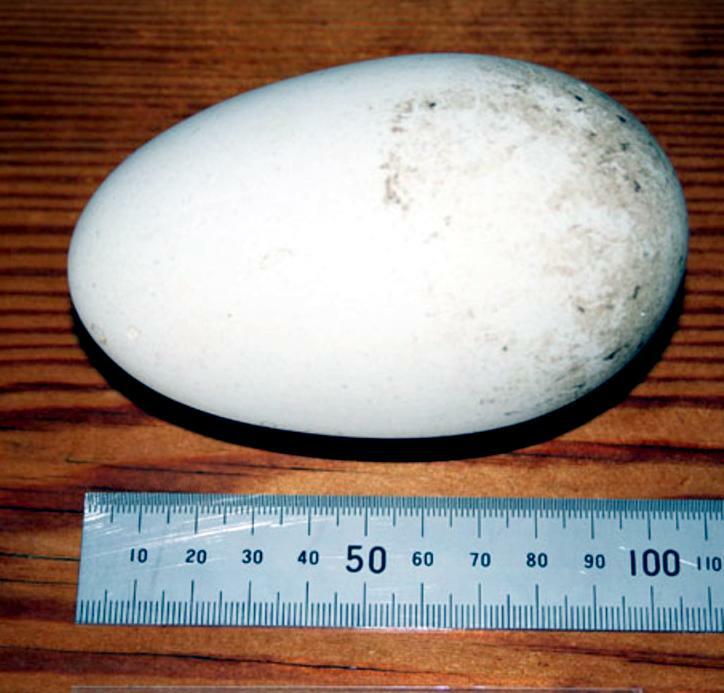 The single large (104 x 64 millimeters) white egg is laid in October-November or January-February and hatches after 68-72 days. 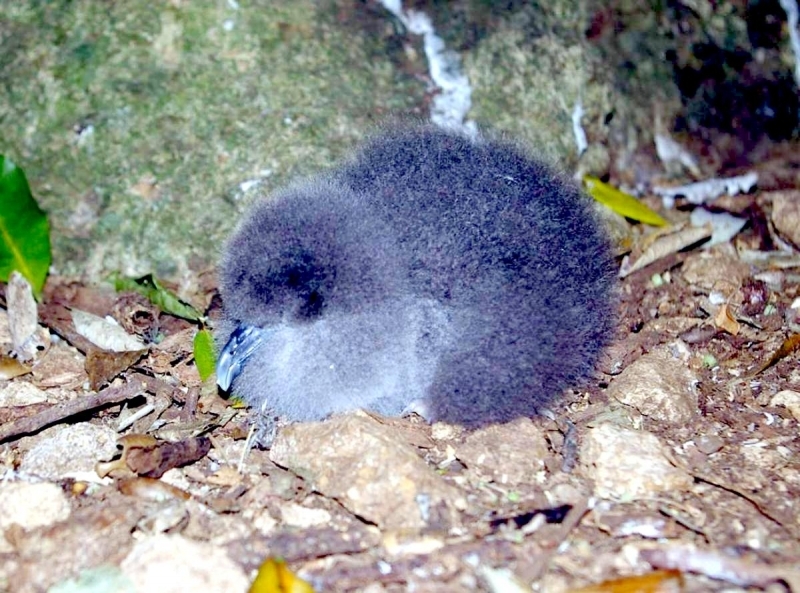 Chicks on the Snares Islands fledge when about 167 days old mainly in August & September, with stragglers into October. 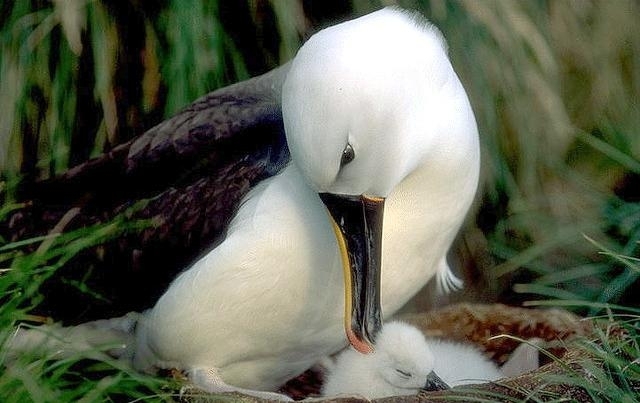 Young are independent at fledging; they begin breeding when about 12 years old and can live more than 45 years. 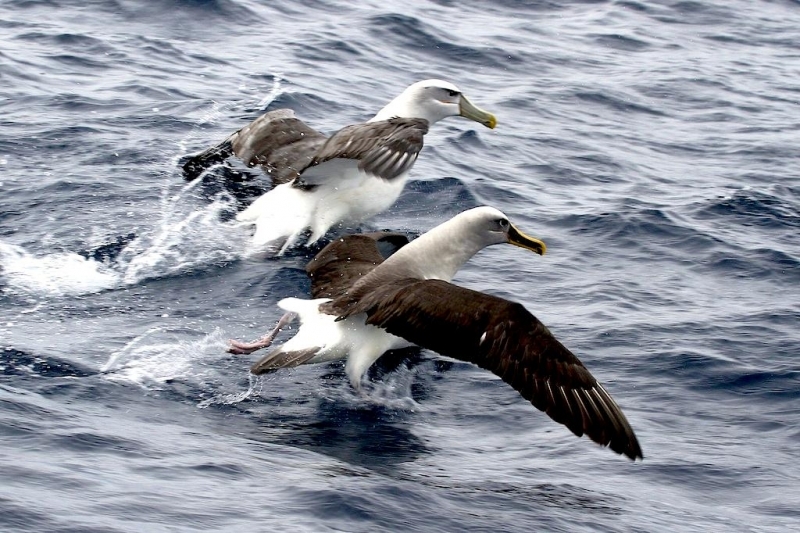 As a typical albatross, the Buller’s Albatross have perfected soaring flight. 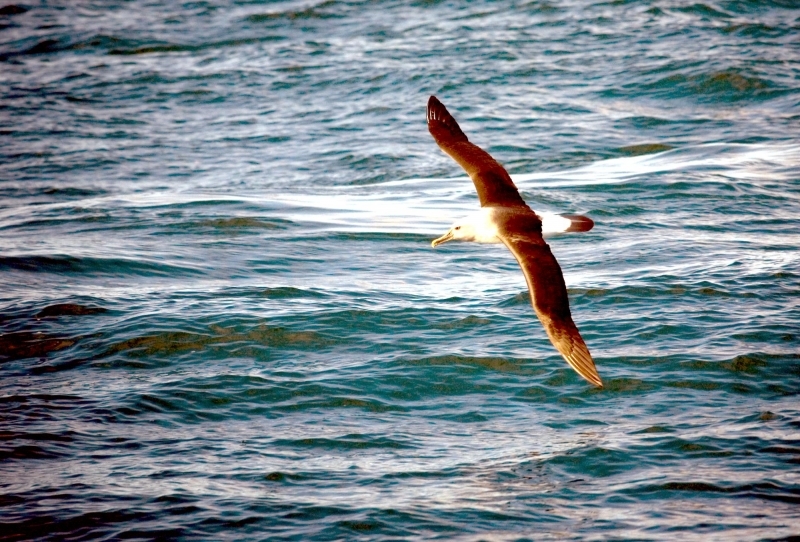 In strong winds, they wheel effortlessly on their long, narrow, stiffly held wings. 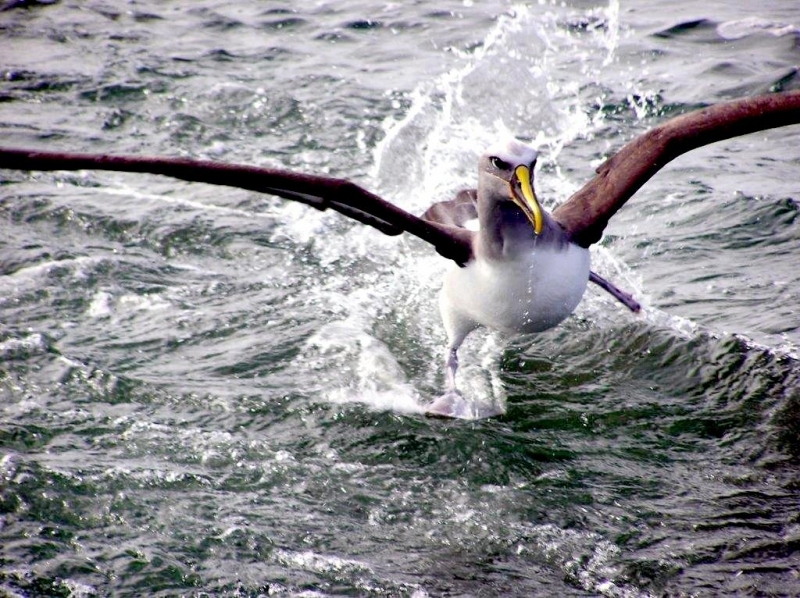 They use their webbed feet for swimming and as rudders when coming in to land. 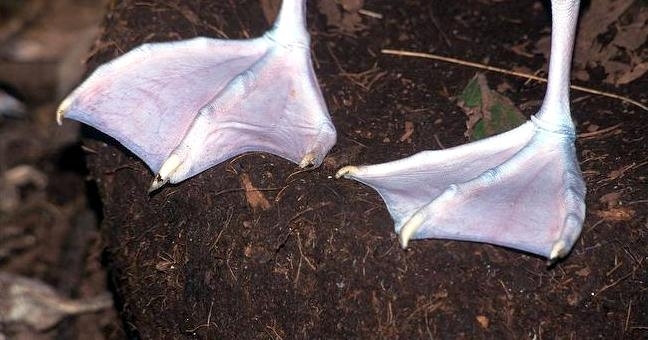 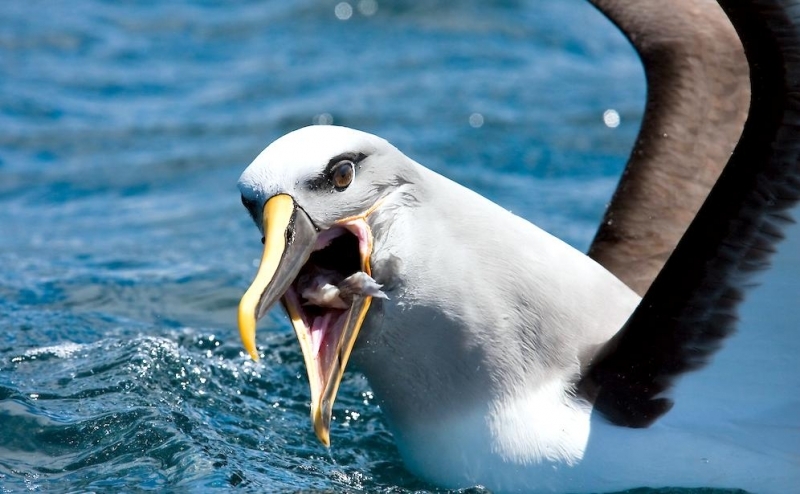 Their strongly hooked bills are used to grasp prey while the sharp edges of the upper mandible are used to slice it into manageable portions. 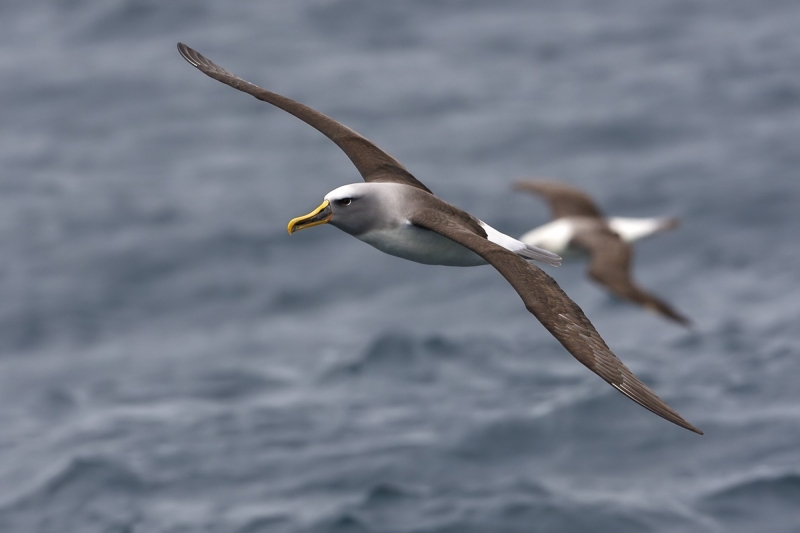 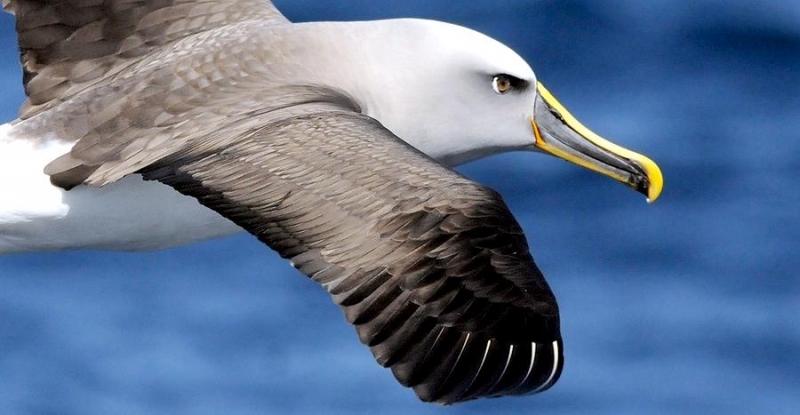 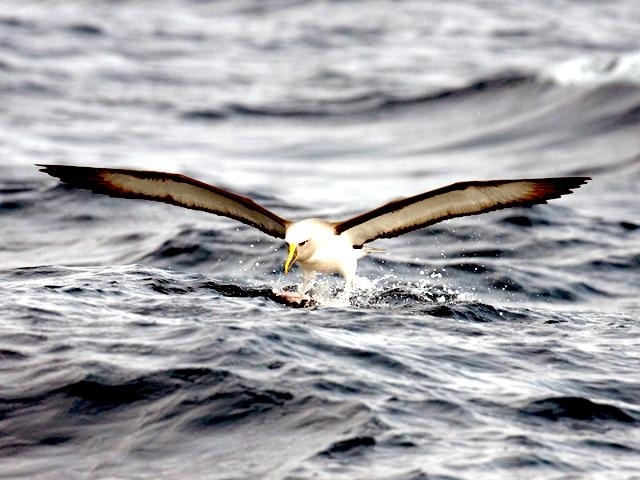 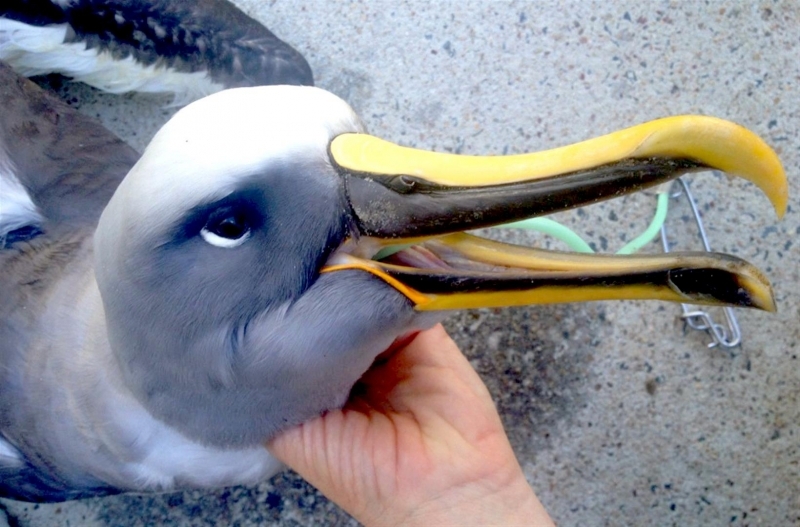 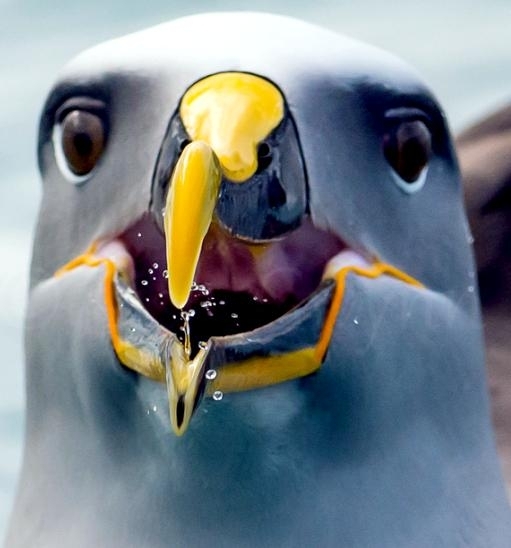 However, the Buller’s Albatross has a great capacity to extend the throat and so swallow large pieces of food. 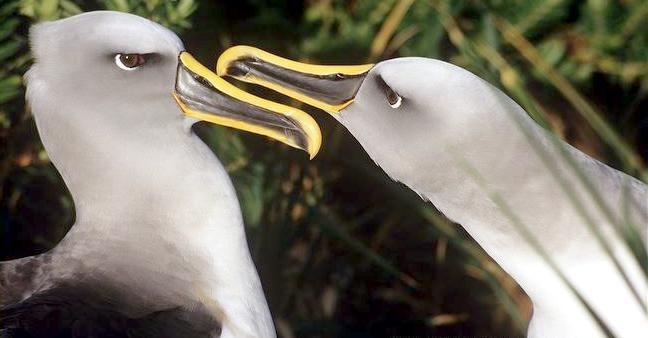 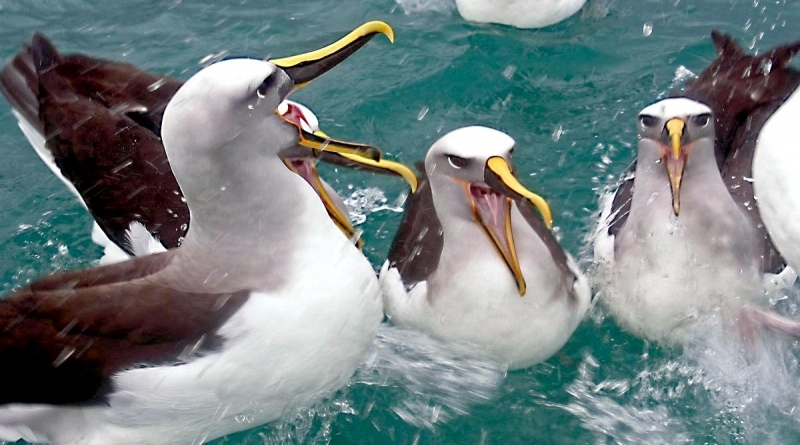 At their breeding colonies, the Buller’s Albatross use an elaborate series of displays & calls to maintain their pair bond and to defend their nest pedestal. 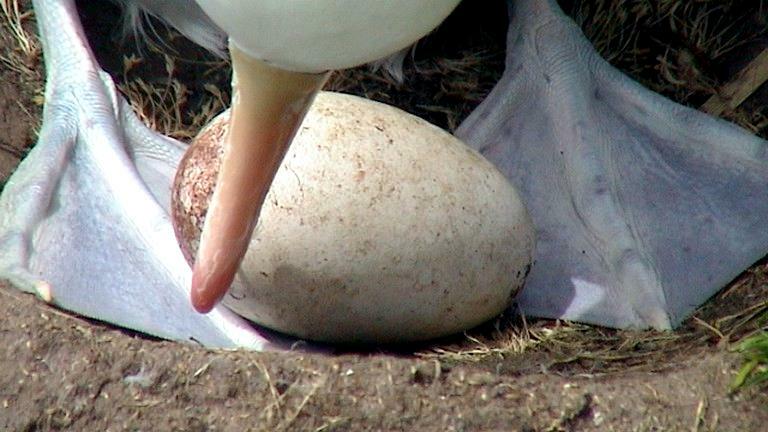 They are annual breeders that usually return to the same nest site year after year with the same partner. 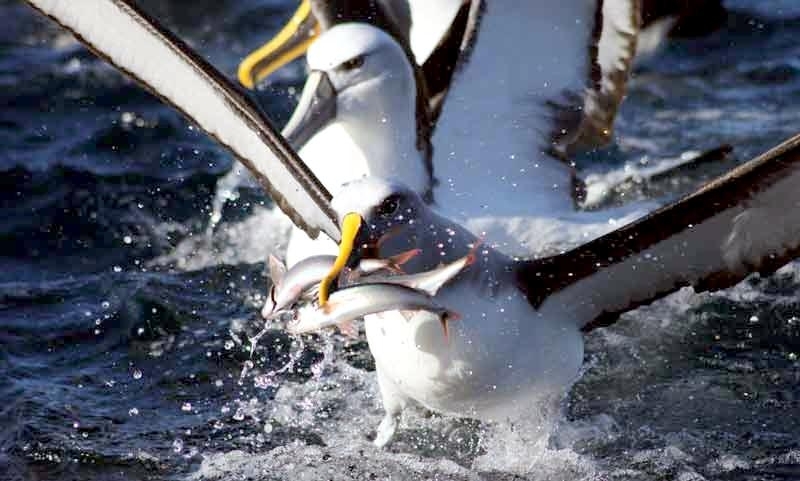 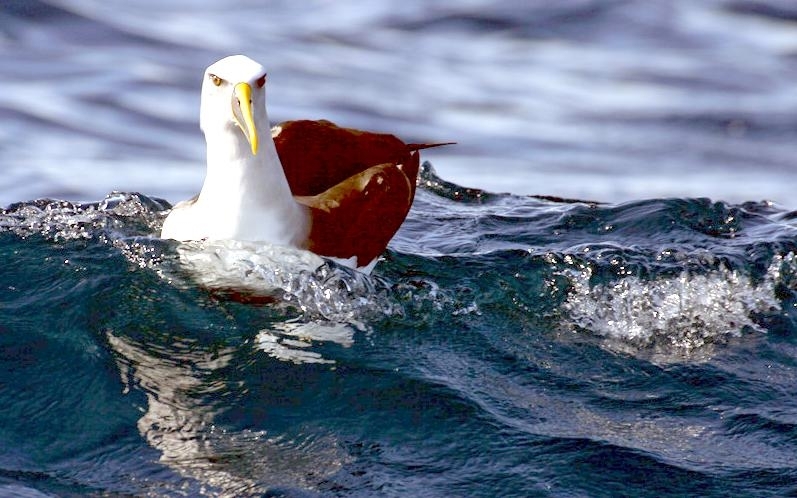 After breeding, the colonies are deserted and these seabirds migrate across the Pacific to seas off Chile & Peru. 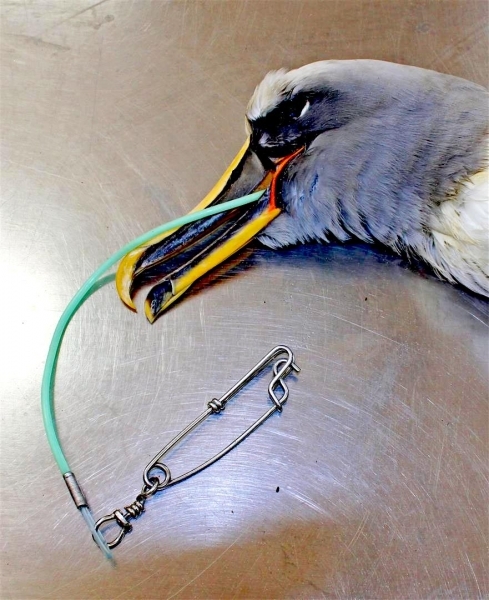 Banding shows that 92%-97% of adults survive from one year to the next. 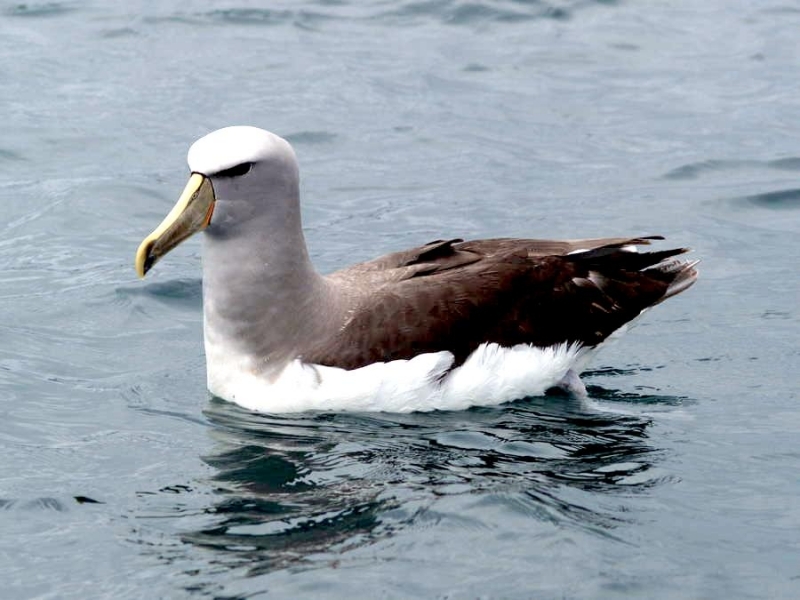 The oldest banded Buller’s Albatross was estimated to be at least 54 years old. 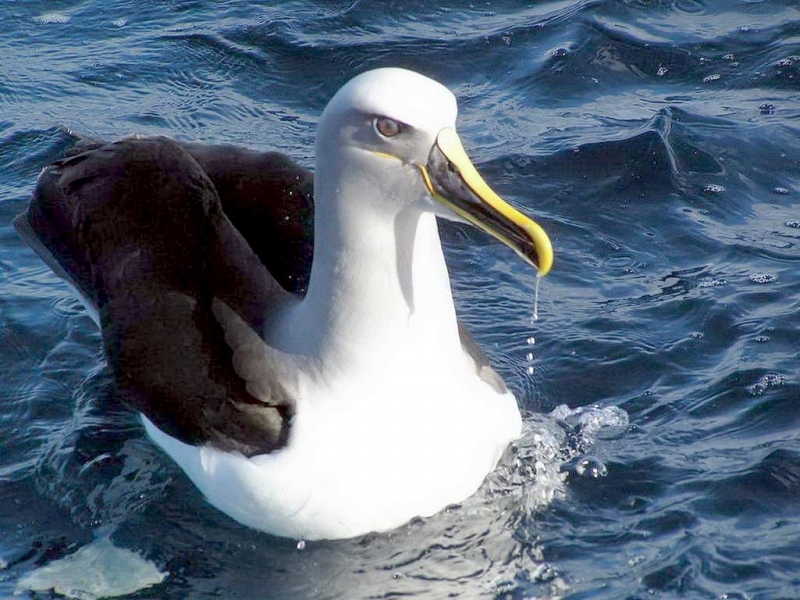 The Buller’s Albatross mainly eat fish, squid, krill, salps and offal from fishing vessels taken from the surface as they rarely plunge or dive for food.